Renal fibrosis is the common pathway of progression for patients with CKD and chronic renal allograft injury (CAI), but the underlying mechanisms remain obscure. We performed a meta-analysis in human kidney biopsy specimens with CAI, incorporating data available publicly and from our Genomics of Chronic Renal Allograft Rejection study. We identified an Src family tyrosine kinase, hematopoietic cell kinase (Hck), as upregulated in allografts in CAI. Querying the Kinase Inhibitor Resource database revealed that dasatinib, a Food and Drug Administration–approved drug, potently binds Hck with high selectivity. In vitro, Hck overexpression activated the TGF-β/Smad3 pathway, whereas HCK knockdown inhibited it. Treatment of tubular cells with dasatinib reduced the expression of Col1a1. Dasatinib also reduced proliferation and α-SMA expression in fibroblasts. In a murine model with unilateral ureteric obstruction, pretreatment with dasatinib significantly reduced the upregulation of profibrotic markers, phosphorylation of Smad3, and renal fibrosis observed in kidneys pretreated with vehicle alone. Dasatinib treatment also improved renal function, reduced albuminuria, and inhibited expression of profibrotic markers in animal models with lupus nephritis and folic acid nephropathy. These data suggest that Hck is a key mediator of renal fibrosis and dasatinib could be developed as an antifibrotic drug. Renal fibrosis, characterized by glomerulosclerosis, interstitial fibrosis, and tubular atrophy (IF/TA) is the final common pathway of progression of kidney disease mediated by activation of multiple cellular pathways.1 Both renal parenchymal cells and nonrenal cells have been incriminated in the generation of the matrix-producing cells in diseased conditions.2 A better understanding of the mechanism of this disease process is not only imperative for elucidating the pathogenesis of CKD and chronic renal allograft injury (CAI), but also provides novel insights into developing new therapeutic strategies. Systems biology approaches can help understand pathogenesis and identify potential new targets for complex diseases such as CKD/CAI. Therefore, we performed meta-analysis of gene expression data from renal allografts of patients with CAI by incorporating publicly-available data and our Genomics of Chronic Renal Allograft Rejection (GoCAR) data. We identified 85 differentially-expressed genes in human renal allografts with CAI compared with non-CAI by using two meta-analysis methods. CAI was defined in our GoCAR study as a chronic allograft dysfunction index score ≥2 at 12-month surveillance biopsies, as reported by a central core laboratory.3 Sample sizes and CAI criteria in publicly-available data sets are summarized in Supplemental Table 1. Interestingly, hematopoietic cell kinase (Hck) was identified in this analysis with a meta-effect size of 1.39 (FDR=0.01) and significantly upregulated in three out of six studies with q<10% (Fisher exact P=0.05) (Figure 1A). In addition, Hck expression was strongly correlated with chronic allograft dysfunction index, IF/TA, ci, cg, and ct scores (Supplemental Table 2). We then performed pathway and network analysis on Hck using QIAGEN’s Ingenuity Pathway Analysis (IPA) and discovered that 23 out of these 85 differentially-expressed genes interacted with Hck either directly or indirectly through a third gene (Figure 1B, Supplemental Table 3). Hck is a potential mediator of CKD. (A) Forest plot for Hck for six datasets from meta-analysis. (B) Hck network is upregulated in chronic allograft nephropathy after kidney transplantation. Relative Hck transcript levels were upregulated in IgA and lupus nephritis in human (C) and in diabetic nephritis in mice (D) from Nephromine database. (E) Relative Hck transcript levels increased in 7 days UUO, diabetic nephropathy, and lupus nephritis, by RT-PCR (normalized to GAPDH), from whole cortices. (C, D, and E) Values are mean±SEM; *P≤0.05, **P≤0.001, ***P≤0.001 between means; one-way ANOVA with Bonferroni multiple comparison test. To further confirm the role of Hck in renal fibrosis, we examined whether Hck upregulation was also encountered in other fibrotic kidney diseases. We searched the data on Hck transcript expression in the kidney from the Nephromine database (https://www.nephroseq.org/resource/login.html) and identified that Hck was significantly upregulated in diabetic nephropathy, IgA nephropathy, and lupus nephritis, whereas there was no change of Src expression in these diseases (Figure 1, C and D, Supplemental Table 4). Next, we experimentally confirmed the significant upregulation of Hck-transcript in kidneys of mice with diabetic nephropathy and lupus nephritis by qPCR, compared with controls, whereas there was no significant change of Src expression (Figure 1E). Together, these findings suggest that Hck is a key Src kinase family member involved in renal fibrosis. To identify a specific inhibitor for Hck, we used Kinase Inhibitor Resource (KIR) which allows us to identify inhibitors with potent binding and selectivity for different kinases. Using this approach, we found dasatinib (BMS-354825; Bristol-Meyers Squibb) to be a potent inhibitor of Hck with high binding affinity and selectivity (kinase activity score=2.18; Gini score=0.75), whereas dasatinib inhibits Src with much lower binding affinity (Supplemental Table 5). Dasatinib is an ATP-competitive inhibitor which has been approved by the Food and Drug Administration for treatment of imatinib-resistant chronic myelogenous leukemia. It suppresses T cell activation and proliferation7 and also reduces NK cell cytotoxicity.8 Interestingly, a recent study has shown that mice treated with dasatinib had ameliorated acute rejection and extended allograft survival compared with untreated controls in a heart transplant model.9 Because dasatinib is generally well tolerated,10 we determined here whether dasatinib could be repurposed as a novel therapeutic drug to treat renal fibrosis through inhibition of Hck. First, we performed in vitro studies to determine the role of Hck and the effects of dasatinib in renal tubular epithelial cells. TGF-β is a key fibrogenic growth factor which plays a central role in CKD and CAI.11 To examine the role of Hck on activation of TGF-β signaling we overexpressed and knocked-down Hck in HEK-Blue TGF-β 293-T cells which express a Smad3-reporter (Supplemental Figure 6). We found that Hck overexpression significantly potentiated TGF-β–induced Smad3 signaling, whereas shRNA-mediated knockdown of Hck inhibited TGF-β–induced Smad3 signaling (Figure 2A). Then, we examined the role of Hck on expression of Col1a1, which is a well known target of TGF-β, in renal tubular epithelial cells (HK2). By qPCR, we found treatment of dasatinib inhibited Col1a1-expression in HK2 cells treated with TGF-β (Figure 2B). These data support a role of Hck in TGF-β–mediated profibrosis pathway in kidney cells. However, it is possible that Hck could also regulate other growth factors and pathways involved in renal tubular cell injury and fibrosis as well as regulation of the immune system, as described previously.12 This is particularly important for CAI because renal fibrosis in allografts is mediated by both immune and nonimmune pathways. Overexpression and inhibition of Hck in renal tubular cells affects TGF-β/Smad signaling, and inhibiting HCK with dasatinib reduces aSMA and fibroblast cell proliferation. Renal tubular cells were transfected with HCK-overexpression construct or empty vector, or alternatively transduced with HCK-specific shRNA or scramble lentiviral constructs, and cultured in the presence/absence of TGF-β. (A) Transfection HCK overexpression vectors in HEK-Blue TGF-β cells activated TGF-β/Smad pathway, whereas lentiviral shRNA-mediated knockdown Hck inhibited TGF-β/Smad signaling. (B) In the presence of TGF-β, treatment of HK-2 with dasatinib can reduce Collagen1 expression, compared with vehicle-treatment (n=3). (C) α-SMA mRNA levels by qPCR are depicted (normalized to GAPDH) (n=3). (D) Treatment of fibroblast (Rat NRK-49F) cells with dasatinib reduced proliferation in a dose-dependent manner (n=4). (Con: empty vector, ORF: HCK overexpression vector; scramble: lentiviral scramble-shRNA, shRNA: lentiviral HCK-shRNA). Values are mean±SEM; *P≤0.05, **P<0.001, ***P<0.001 between means; one-way ANOVA with Bonferroni multiple comparison test. It is well known that myofibroblasts, characterized by the production of contractile filaments (α-SMA), are considered to be the central cell type for the pathologic accumulation of ECM occurring in response to prolonged tissue injury and chronic inflammation.13,14 Therefore, we studied the role of Hck in myofibroblast activation. We treated rat fibroblasts (NRK-49F) with dasatinib and found a significant reduction of α-SMA expression in dasatinib-treated cells, compared with controls (Figure 2C), suggesting an inhibition of myofibroblast activation. In addition, we found that dasatinib inhibited fibroblast proliferation in a dose-dependent manner compared with vehicle-treated cells (Figure 2D). Next, we aimed to examine whether Hck mediates renal fibrosis in vivo. We treated mice with unilateral ureteral obstruction (UUO) with either dasatinib or vehicle using daily gavage starting 2 days before the surgery. Mice were euthanized at either 3 or 7 days after the surgery (Figure 3A). At 3 and 7 days, Hck expression was significantly increased in UUO kidneys compared with controls (Figure 3D). Immunohistochemistry for phosphorylated-Hck (Y410) confirmed increase of HCK-activation in UUO, whereas dasatinib treatment inhibited this activation (Figure 3C). Phosphorylation of SMAD3 was significantly inhibited in the UUO kidneys of dasatinib-treated mice compared with vehicle-treated mice (Figure 3B). At 3 days, dasatinib treatment significantly diminished the upregulation of inflammatory markers, such as CCL3, CCL5, and TNFα, seen in the obstructed kidneys of vehicle-treated mice (Supplemental Figure 7). Expression of profibrotic markers such as Col1a1, Fibronectin, and Snail were also significantly inhibited in the obstructed kidneys of dasatinib-treated mice compared with vehicle-treated mice, as assessed by real-time PCR at 7 days (Figure 3D). 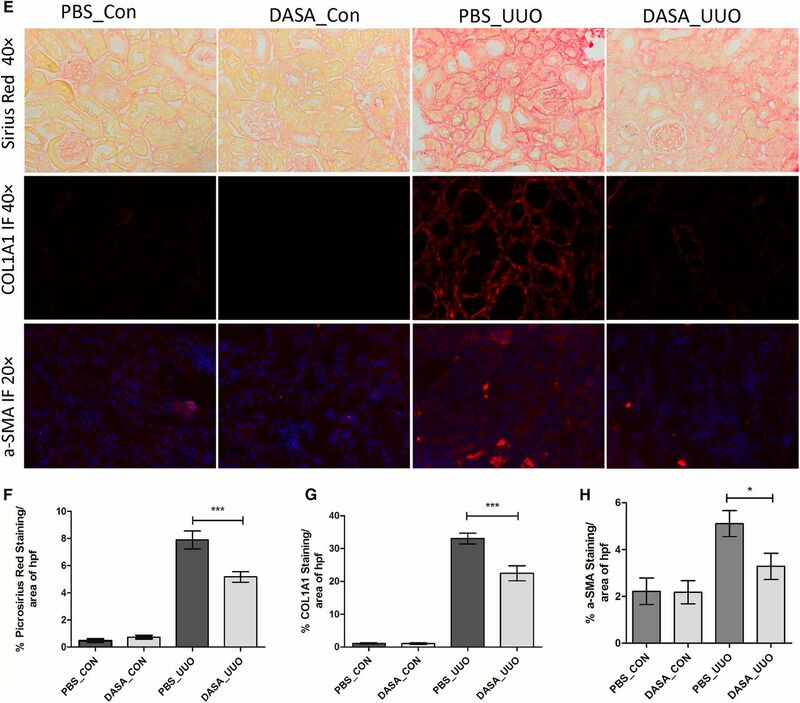 Furthermore, immunofluorescence studies demonstrated that Col1a1 and a-SMA protein levels were significantly reduced in the UUO kidneys after dasatinib treatment (Figure 3E, middle and lower rows, Figure 3, G and H, respectively). Renal interstitial fibrosis, measured by picrosirius red staining, was also significantly attenuated in dasatinib-treated mice (Figure 3, E and F). These data confirm a therapeutic role of dasatinib in UUO, a commonly used model to assess renal fibrosis. Inhibiting Hck in vivo attenuates kidney fibrosis by TGF-β1/SMAD3 signaling in a murine UUO model. UUO was performed on male C57BL/6 mice, gavaged with dasatinib or vehicle. Mice were perfused 3 or 7 days later. (A) Scheme of the experimental approach is shown. (B) WBs of phospho-SMAD3, t-SMAD3 from mouse kidney cortex lysates at 7 days post-UUO are shown for kidneys of PBS and dasatinib-gavaged mice. (C) Immunohistochemistry for anti-Hck (phosphorylation Y410) antibody in mouse kidney confirming dasatinib inhibiting HCK’s activation. Original magnification, ×200. Also, (D) Hck transcription level was increased in 3 and 7 days UUO kidneys by RT-PCR (normalized to GAPDH). (D) mRNA-levels of profibrotic markers at 7 days post-UUO by RT-PCR (normalized to GAPDH), from whole cortices of control and UUO kidneys of dasatinib- and PBS-fed animals (n=5). (E) Representative ×40 images from control and UUO kidneys of dasatinib- and PBS-gavaged mice at 7 days post-UUO. Picrosirius red stain (top row), and COL1A1 IF (middle row, red: COL1A1; blue: DAPI), and a-SMA IF (lower row, red: a-SMA; blue: DAPI) are depicted here. (F, G, and H) Morphometric quantification of thresholded ×40 images (n=6 animals; ten random hpfs per animal), showing area of (F) picrosirius red staining, (G) COL1A1 IF, and (H) a-SMA IF as a percentage of total hpf area. (B, C, D, F, G, and H) Values are mean±SEM; *P=0.05, **P<0.001, ***P<0.001 between means; one-way ANOVA with Bonferroni multiple comparison test. Whereas UUO is a useful model to examine tubulointerstitial fibrosis in vivo, it does not permit assessment of differences in renal function.15 Hence, mouse models of lupus nephritis and folic acid nephropathy (FAN) were used to examine the role of HCK-inhibition in preserving renal function. We treated lupus mice (MRL-lpr strain, 8 weeks old) by daily gavage of dasatinib at a dose of 5 or 10 mg/kg for 2 months (Figure 4A). At euthanasia, BUN level and urinary albumin-to-creatinine ratio were both significantly decreased in lupus mice with dasatinib treatment compared with vehicle (Figure 4, B and C). 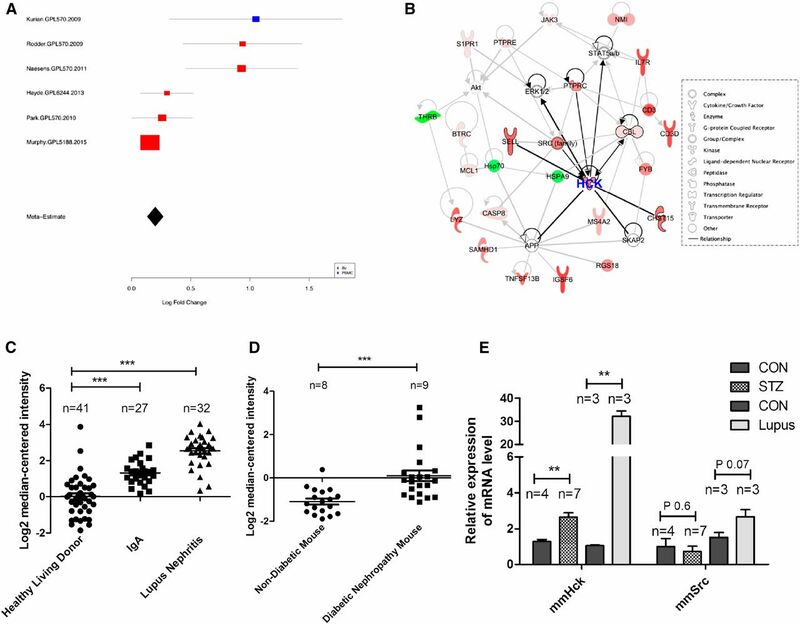 Expression of profibrotic markers such as Col1a1, Fibronectin, Snail, Fsp-1, Vimentin, Slug, and MMP-2 were also significantly inhibited in dasatinib-treated lupus mice compared with vehicle-treated lupus mice, as assessed by real-time PCR (Figure 4D). In lupus mice, histologic indices of disease activity were also ameliorated by dasatinib (Supplemental Figure 6). Next, in the FAN model, mice were treated with either dasatinib or vehicle for 4 weeks after injection of folic acid (FA). We found that dasatinib treatment significantly reduced BUN and expression of profibrotic markers in mice with FAN compared with vehicle treatment (Figure 4, E and F). These data further confirm a therapeutic role of dasatinib in lupus and FAN models, in ameliorating fibrosis and improving kidney function. 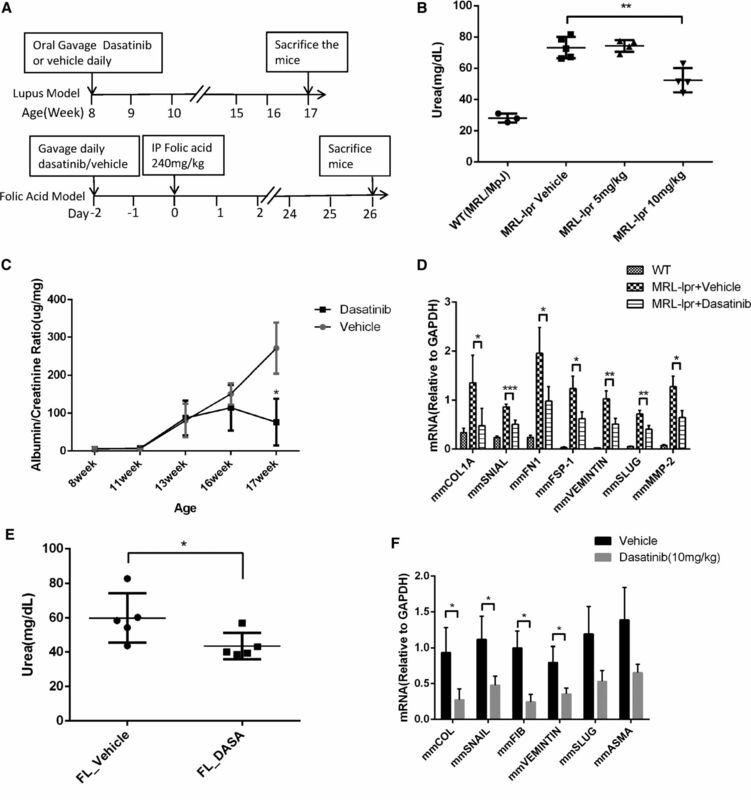 Inhibiting Hck in vivo ameliorates kidney function and attenuates fibrosis in murine lupus and FAN models. Lupus model of MRL/lpr mice were gavaged with dasatinib or vehicle daily (n=4 pairs) from 8 to 17 weeks then perfused. FA acid was injected at 240 mg/kg, and dasatinib or vehicle was gavaged 2 days before FA injection and continued until day 26. (A) Scheme of the experimental approach is shown. BUN levels were decreased in dasatinib-treated group in lupus model (B) and FAN model (E), compared with vehicle group. (C) Urinary albumin-to-creatinine ratio was measured for lupus mice from 8 to 17 weeks at 2- to 3-week intervals in dasatinib- and vehicle-gavaged mice. (D and F) mRNA levels of profibrotic markers for lupus mice and FA mice by RT-PCR (normalized to GAPDH), from whole cortices of kidneys of dasatinib- and vehicle-fed animals. (B, C, D, E, and F) Values are mean±SEM; *P=0.05, **P<0.001, ***P<0.001 between means; one-way ANOVA with Bonferroni multiple comparison test. CAI, characterized by IF/TA, arises from diverse causes and is the most prevalent cause of long term renal allograft failure in the first post-transplant decade.16 However, there remains a lack of effective treatment strategies to prevent or treat chronic allograft damage. Because our analysis is on the basis of the transcriptomic data from patients with CAI, we believe that Hck is a key mediator of CAI. Hck is likely involved in both immune17 and nonimmune12 pathways for chronic kidney injury and fibrosis. Khatri et al. showed that dasatinib can regulate specific common rejection module genes providing benefit in acute cellular rejection in allografts.9 Our data show that inflammatory gene expression was inhibited at 3 days post-UUO with Hck inhibition, whereas we did not observe similar reductions in inflammatory cell infiltrate in UUO-kidneys with dasatinib treatment. This data suggests that in the UUO model dasatinib may inhibit the expression of inflammatory genes in infiltrating cells or that the inflammatory gene expression may arise from injured tubular cells (Supplemental Figures 8–11). On the other hand, we observed significantly reduced infiltration of T cells and macrophages with dasatinib treatment in lupus nephritis mice where inflammation is a major event in the disease pathogenesis (Supplemental Figures 12–15). Hence, here we show for the first time that Hck inhibition by dasatinib attenuates renal fibrosis and maintains renal function by inhibiting inflammation, fibroblast activation and proliferation, and TGF-β–SMAD signaling in renal tubular cells. We applied a systems biology approach to allograft biopsy transcriptome data at 12 months post-transplant, from our prospective cohort and publicly available datasets with similar published outcomes. We thus identified Hck as a key driver in renal fibrosis at an early stage of the renal injury/fibrosis process, suggesting that Hck could be an effective target to retard fibrosis in these patients. Because IF/TA is also a key component in CKD from other causes, we validated this association in CKD cohorts and in more general renal fibrosis models. This suggests a more general role of Hck in renal fibrosis. Dasatinib is already FDA-approved for imatinib-resistant chronic myeloid leukemia. Hence, dasatinib could be easily translated into clinical trials and repurposed for different progressive kidney diseases. Although multiple profibrotic factors have been documented, including various growth factors and cytokines, it is widely accepted that TGF-β and its canonic downstream Smad3 signaling pathway play an essential role.18,19 Our results suggest an interaction between Hck and Smad3 pathways. However, the mechanism by which Hck regulates the TGF-β/Smad3 pathway requires further studies. Multiple cell types contribute to ECM production in renal fibrogenesis.13,14,20 In renal fibrotic lesions, α-SMA production by myofibroblasts is considered central to renal fibrogenesis.21–24 Our results show that inhibition of Hck via dasatinib significantly reduces fibroblast cell proliferation as well as α-SMA expression, indicating a critical role for Hck in myofibroblast formation and proliferation. Our study has several limitations. Hck is expressed in both renal and nonrenal cells, and Hck inhibitors likely have wide-ranging effects including immune and nonimmune cells. Our studies did not address the cell type–specific role of dasatinib. However, our data suggest that dasatinib likely has effects in both immune and nonimmune cells. The role of dasatinib in immune cells has been previously reported.25 This study was also not designed to address individual roles of each Src kinase family member. Dasatinib could have inhibitory effects on other Src kinase family members. However, our analysis of the meta-data identified Hck as a key driver and did not reveal any other Src kinase family members, and only Hck among Src-kinase family members was consistently upregulated in all assessed animal and human kidney disease models. Therefore, although we could not rule out the role of other Src kinases, we believe that Hck is more likely a key driver of renal fibrosis compared with other members of the Src kinase family. In conclusion, our data suggests that Hck is a key mediator of renal fibrosis via its effects on inflammation, fibroblast cell proliferation, and regulation of TGF-β signaling. Our data suggest that dasatinib could be potentially repurposed as an antifibrosis drug for kidney disease. We mined five publicly-available microarray datasets from Gene Expression Omnibus and one in-house dataset of GoCAR studies related with chronic allograft injury after renal transplantation. We analyzed the six datasets using two different meta-analysis methods as described in our previous study9,27,28: (1) combining the effect sizes, and (2) combining SAM q values. We used the FDR≤5% as cutoff for selecting significant genes for the first meta-analysis. We used P≤0.05 from Fisher exact analysis on the basis of the number of significant q values from SAMR to assess the enrichment for the second meta-analysis. We used QIAGEN’s IPA (QIAGEN Redwood City, http://www.qiagen.com/ingenuity) to generate the network for direct relationships of Hck and other significantly-expressed genes specific to CAI. We chose −log10 P>1.3 as a threshold for identifying significant relationships in IPA. We used a published KIR26 to identify the inhibitors with the most potent binding activity and highest selectivity score to the target kinase. The KIR examined 178 known kinase inhibitors against a panel of 300 recombinant human protein kinases in duplicate using a high-throughput enzymatic assay.26 Each kinase inhibitor pair was reported with a kinase activity score, which was tested in duplicate and results were expressed as percent of remaining kinase activity in the presence of the inhibitor relative to control reactions with solvent alone. The lower the score, the greater the kinase inhibition. To assess the selectivity of the inhibitor, the Gini score (on a scale of 0–1) was used to evaluate the degree to which the aggregate inhibitory activity of a compound (calculated as the sum of inhibition for all kinases) is directed toward only a single target (Gini score=1) or is distributed equally across all tested kinases (Gini score=0). More selective inhibitors are associated with higher Gini scores. HEK-Blue TGF-β cells were kindly provided by Paolo Cravedi (Mount Sinai, NY). Rat kidney fibroblast cells (NRK-49F, ATCC CRL-1570), and HEK293 (ATCC CRL-1573) and HK2 (ATCC CRL-2190) cells were obtained from ATCC. Expression-ready lentiviral constructs for Hck overexpression and shRNA-mediated knockdown were purchased from GE Dharmacon (CCSB-Rroad lentiORF-Hck clone: ccsbBroad304_00733; GIPZ Hck shRNA clone1: V2LHS_133007; clone2: V2LHS_133010; clone3: V2LHS_237454; clone4: V3LHS_389299). 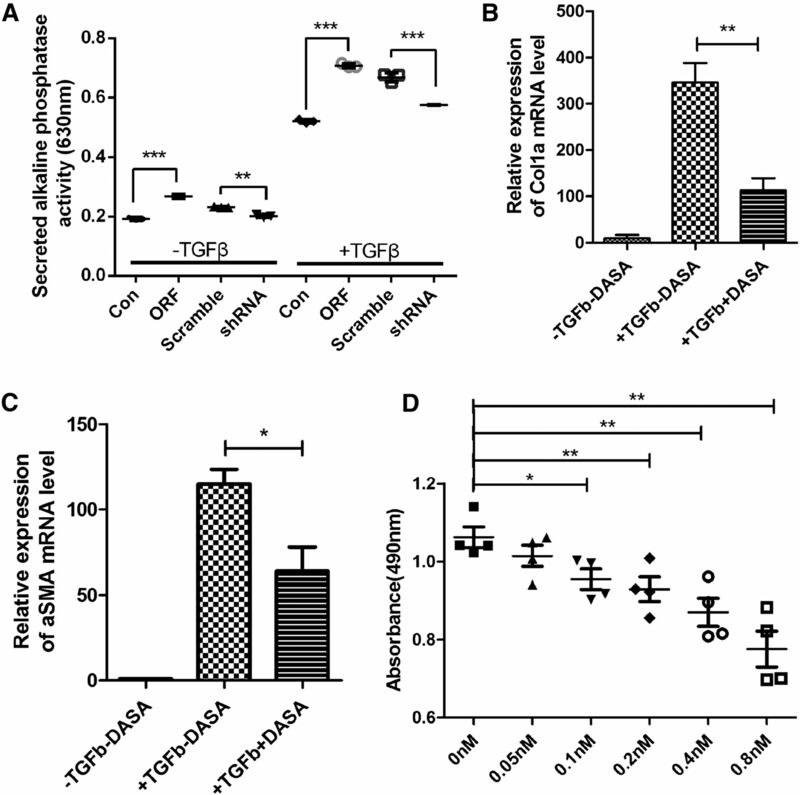 Negative control overexpression and shRNAs were used as negative experimental controls. PolyJet In Vitro DNA Transfection Reagent was used to transfect constructs to HEK-Blue TGF-β cells. HEK-Blue TGF-β cells allow the detection of bioactive TGF-β by monitoring the activation of the TGF-β/Smad pathway. Firstly, Hck overexpression, knockdown, and control vectors are transfected by PolyJet (SignaGen) In Vitro DNA Transfection Reagent. Cell starving was performed by 0.5% FBS medium after transfection, then we treated with 5 ng/ml of TGF-β for 24 hours. TGF-β detection with spectrophotometer followed a protocol provided by the manufacturer. RNA was extracted using the TRIzol Reagent (Thermo Fisher Scientific) from cell and whole kidneys. One thousand nanograms of RNA was used to prepare cDNA. Quantitative real-time PCR was performed using Qiagen QuantiTect One Step RTPCR SYBR green kit (Qiagen). Data were analyzed by the 2−ΔΔCT method and presented as fold change relative to a control sample after normalization against the expression of housekeeping genes. Tissue or cells were lysed with a buffer containing 1% NP40, a protease inhibitor cocktail, and phosphorylation inhibitors. The following antibodies were used: antibody to mouse Hck (rabbit monoclonal Hck, catalog no. sc-72; Santa-Cruz), phospho-SMAD3 antibody (rabbit polyclonal, catalog no. 9520S; Cell Signaling), anti-SMAD3 (rabbit monoclonal, catalog no. 9513S; Cell Signaling), and to β-actin and GAPDH (Sigma). The Institutional Animal Care and Use Committee of Mount Sinai School of Medicine approved all animal studies. Wild-type BALB/cJ mice at 8 weeks were obtained from The Jackson Laboratory. Male animals (n=3 per group for 3 day UUO, n=5 for 7 day UUO) were anesthetized and ureteral obstruction was performed by the double ligation of the right ureter with 4–0 silk via a right flank incision. Sham-operated mice had their ureters exposed and manipulated but not ligated. On the basis of previous publications, we studied expression of EMT markers, and renal fibrosis at days 3 and 7 post-UUO.27 Nonobstructed kidneys were used as controls. The kidneys were collected at the end of the study for histology, assessment of collagen content, western blot, and real-time PCR analysis. Mice were fed vehicle or Hck inhibitor dasatinib at 20 mg/kg body wt 2 days before UUO described by daily gavage until they were euthanized. For IF, snap-frozen kidney sections were formalin-fixed and treated with anti-COL1A1 antibody (1:100 dilution; catalog no. 1310–01; Southern Biotech) overnight, and subjected to fluorescence microscopy. Picrosirius red staining was performed to assess fibrosis.31 Renal cortical collagen content was determined by morphometric measurement of areas stained with picrosirius red.27 Immunohistochemistry for inflammatory cell infiltration in UUO kidney in paraffin section was performed by the pathology core in Biorepository and Pathology CoRE at Mount Sinai. The antibodies and dilutions were as follows: B cell CD45/B220 antibody (BD Biosciences 550286 in 1:75 dilution); T cell CD3 (Abcam ab5690 in 1:250 dilution); macrophage cell MAC-2 (Galectin-3) (Cedarlane CL8942AP in 1:1500 dilution). H&E staining for paraffin-embedded lupus kidney samples and quantification of lupus nephritis (mesangial cellularity, interstitial inflammation, perivascular inflammation, activity index) were performed by a pathologist. Data were expressed as mean±SEM (X±SEM). Unpaired t test was used to analyze data between two groups after determination of data distribution. The Bonferroni correction was used when more than two groups were present. Statistical significance was considered when P<0.05. J.T.D. owns equity in NuMedii Inc. (Palo Alto, CA), and has received consulting fees or honoraria from Janssen Pharmaceuticals (Raritan, NJ), GlaxoSmithKline (Philadelphia, PA), AstraZeneca (Wilmington, DE), and LAM Therapeutics (Guilford, CT). B.M. is supported by National Institutes of Health (NIH) 1U01AI070107 and 1R01DK102420-01A1. J.C.H. is supported by NIH 1R01DK078897, NIH 1R01DK088541, the James J. Peter Veterans Affairs Medical Center Merit Award, and NIH P01-DK-56492. M.C.M. is supported by American Heart Association 15SDG25870018. J.T.D. is supported by the National Institute of Diabetes and Digestive and Kidney Diseases (R01DK098242) and National Cancer Institute (U54CA189201). C.W. and L.L. contributed equally to this work. This article contains supplemental material online at http://jasn.asnjournals.org/lookup/suppl/doi:10.1681/ASN.2016020238/-/DCSupplemental.